This Welwitschia mirabilis, nicknamed "The Big Welwitschia" stands 4.6 ft tall and is over 13 ft in diameter. Welwitschia, dubbed by Wikipedia to be “one of the oddest plants in existence,” is a gymnosperm (it has seeds but not flowers) that is so unique that it has an order all to itself (in contrast, we humans share our order, Primates, with everything from lemurs to orangutans). Occurring only in the Namib Desert in southwestern Africa, Welwitschia plants can live to be 2,000 years old. 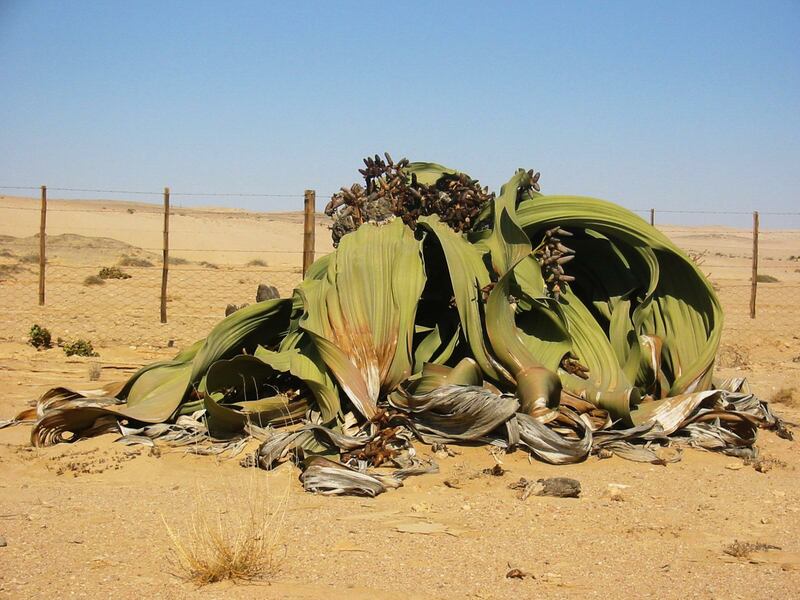 Leaves – Welwitschia plants grow only two leaves, which can be up to 4 m long and never stop growing over the life of the plant. The leaves sometimes split into straps, which would explain why the plant above seems to have more than two leaves. Water-saving adaptations – These long-leaved plants are the only gymnosperms (a term that encompasses everything from ginkgo trees to coastal redwoods) to use the CAM pathway for photosynthesis. The CAM, or crassulacean acid metabolism, pathway for photosynthesis helps plants conserve water and is common in grasses and desert angiosperms (flowering plants), though it makes Welwitschia an exceptional gymnosperm. Welwitschia can also absorb moisture from the air, and they grow a very large tap root that allows them to reach and store deep water. Gymnosperms have strobili instead of flowers. The strobili of conifers like pine trees are better known as cones. Welwitschia have male and female strobili.